In Part 3 of this six-part masterclass series we explore the popular myths around App Store Optimization (ASO), showing what flies and what fails. If you think keywords are 'king', or have built a strategy based on the power of A/B testing to help you make the tough choices about app marketing, then think again. 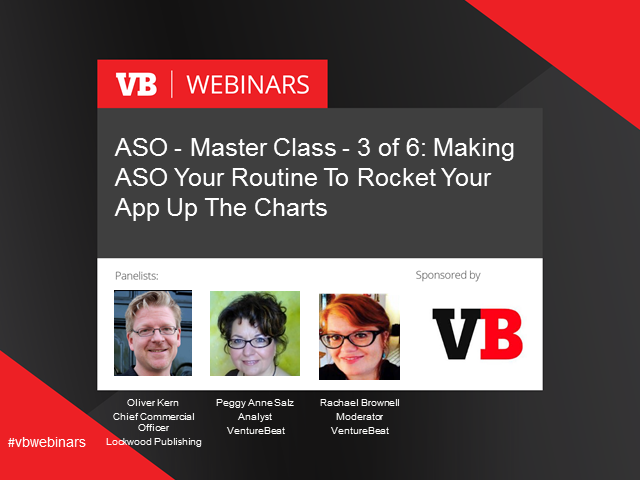 But this masterclass isn't just a chance to reality-check your preconceived notions around ASO and app marketing. It's also structured to provide you the tools and tips to map a realistic and regular ASO routine that allows you address and optimize the key elements of your app presence in the proper order. ASO (which we show in our forthcoming VB Insight Practitioner’s Guide) is not a "set-it-and-forget it" activity. It consists of keywords that you should optimize regularly, to app screenshots that you should update at least quarterly. Learn to distinguish the myths from the industry best practices, and monitor the metrics that will tell you you're on the right track by attending this VentureBeat webinar with Oliver Kern — noted growth-hacker and Chief Commercial Officer at Lockwood Publishing — and Peggy Anne Salz, author of the report. * Put urban legends around ASO to the test in a no-holds barred 'mythbusters' marathon. * Determine how (and when) changes to your app store presence will drive positive results. * Identify the tools, techniques and strategies that will encourage installs and boost sharing.